I went for a checkup yesterday. I hadn’t been to that provider since the year my husband died, so I had to fill out a new medical history. How difficult filling out such forms used to be (and sometimes “still” is)! If you own or manage a business that requires personal information of its clients, make sure your paperwork and/or website includes “widowed” as a category. At least this form offered me the option of “Other” where I could write in my own category: widowed. When I was newly widowed, EVERYTHING reminded me of my loss. It was hard enough coping with grief on a daily (sometimes hourly) basis. I hated having to acknowledge my husband’s death in clinical black and white on the many forms I had to fill out — and there were a LOT of forms. It was excruciating to complete paperwork that ignored the existence of my life-altered status. 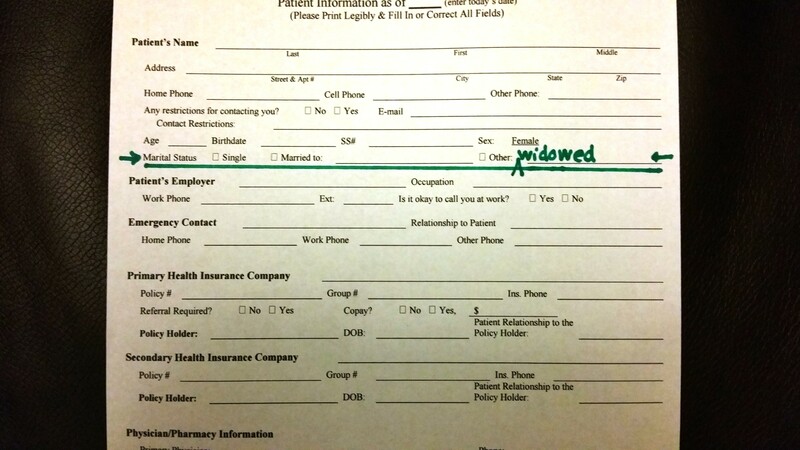 Too often, company (and government) forms offer no appropriate box for widows and widowers to check under “marital status.” On paper I write in my own category, even when there isn’t an option (or enough space) to do so. But online forms can incite scream-inducing, option-lacking frustration. It has been nearly five years since my husband died. Socially, I’ve come to see myself as single again — most days, anyway. But legally, “widowed” still feels like a better fit. I don’t appreciate paperwork forcing me back to the start, forcing me to redefine myself according to its guidelines. As a widow, I’ve had to do enough starting over — and redefining — for myself. *If you don’t know what a widow prefers to be called (Mrs., Ms. or Miss), ask her. She won’t bite, and she’ll appreciate that you respect her enough to want to heed her preference. I heard “Live or Survive” by TREN this morning, and within seconds — before listening to the whole song again and again — I knew I’d share it here. Although this isn’t a song about grief, its music nevertheless speaks to me (or should I say sings?) of the great grief dilemma I’ve faced with the death of each loved one. I’m a fan of the Hunger Games franchise. A big fan. (I won’t admit how many times I’ve read the books by Suzanne Collins and seen the movies.) I hope the producers jump at the chance to include this song. It captures the contradictions Katniss faces within herself as much as with her battle against The Capitol. But that’s not why I feel impelled to share it here, where I write about how to help grieving friends, family, and coworkers. What I heard was a reflection of daily battles with bereavement. “Live or Survive” captures the multifaceted impossibilities of what I call the great grief dilemma for the newly-bereaved: my life is over, but I’m still here to live it. “I hear the call, but will I listen?” — I hear the doctor’s words of diagnosis. Of pronouncement. I know their meaning, but I do not, cannot know what they mean, much less accept them. “Flames pave the sky in the distance.” — My world tumbles upside-down. There’s air beneath my feet, and smoke obscures my eyes. Everything is altered. “Something in my soul craves resistance.” — Denial doesn’t allow me to accept that my loved one is never coming back. Unfinished business or issues will never be resolved. It’s too much to take, so I won’t think about it. My brain is overloaded and my heart won’t let me. “One by one, they drop and fall, hiding beneath already broken walls. Watch them burn to the ground.” — My plans, hopes, dreams, and expectations for the future have died with my husband. Hourly at first, then over days, weeks, and months, loss peels layer after layer from my being. “Can you stand tall against the tide?” — Grief assaults me in waves that knock me to my knees. Mourning often submerges me. Standing requires strength I don’t have. “Will you put your hands in the sky?” — How can I go on? I give up. I can’t do this on my own. “Or curl them into fists and fight?” — I snap at everyone around me, stuck in fight-or-flight battle mode. Uncharitable words I’ve never uttered chip at my defenses until I’m even fighting myself just to keep a civil tongue. “Live or survive. Live or survive.” — If one more person tells me “life goes on,” I’ll scream. Loudly. Because it doesn’t. His didn’t. And yet … and yet … I can’t deny I’m still here. But I’m not living. Not really. Barely. “Gotta pick a side.” — I have to decide. Will I ever do more than go through the motions? Will I ever want to live for myself? “Can you hear them calling?” — Too many calls. Not enough calls. Don’t demand I do things now. I’m not ready. Don’t ignore me, either. I need to be called. I need to know I still matter, even though the one who mattered to me is gone. “Can’t waste time.” — I can’t even tell time, let alone track it. Once-simple, 30-minute tasks take hours. Seasons surprise me. Yet funerary and other business matters demand timely attention my mind can’t pay. “Revolution falling.” — My worldview’s shifting with my upside-down universe. Except for the innermost core of my being (a knowledge that God loves me and will somehow carry me through this), I take nothing else for granted but unpredictable change. “Courage at the core. Go before the fear sets in.” — It requires unspeakable, exhausting courage to manage routine business matters. I count my breathing before asking for help and stave off the panic until I hang up. It takes days to muster the will to make a single phone call, and once I psyche myself up to it I must act. Fast. “Live for something more.” — It’s not possible to live when your other half is severed. Only half a being remains. So when I do learn to live again, it will have to be for something more. “Will you put your hands into the sky? Or curl them into fists and fight? *If you enjoyed TREN’s music as much as I did, please like and share it using #liveorsurvive and #tren. When Mockingjay — Part 2 is released, I’d love to hear “Live or Survive” on the soundtrack!